Two sixth form students who won the British Sugar Academy Excellence Awards competition were given a tour of the IfM as part of a one-week 'money can't buy' internship at British Sugar. The Awards recognise outstanding achievements by Y11, 12 & 13 students and aim to encourage academy students to aspire for success. Emma Carter from Valley Invicta Academies Trust and Harmandeep Singh from Thomas Deacon Academy won this year’s Academy Award Excellence competition thanks to their essays on ‘designing a cooking stove for a remote community which helps to improve their quality of life and well-being’, taking a sustainable approach. The prize was a week-long internship at British Sugar to gain valuable insight into their business and learn about the factory's use of technology to transform sugar beet into a myriad of sustainable products. During the course of their visit on 1st November 2012, the students were introduced to the general engineering course at Cambridge and the integrated approach of the Manufacturing Engineering Tripos run by the IfM. They had a tour of the robotics lab and a number of sessions to give the students a holistic view of education, research and practice in sustainable manufacturing. To conclude the experience, Dr Tim Minshall from the IfM Centre for Technology Management discussed “How can we make manufacturing and careers in manufacturing both relevant and attractive to young people in the UK?”, in order to help develop ideas for promoting engineering and outreach work. Tim is actively involved in activities to raise awareness of engineering among primary and secondary schoolchildren. This experience gave the two winners the chance to consider and reflect on career paths that engineering and manufacturing management can offer. 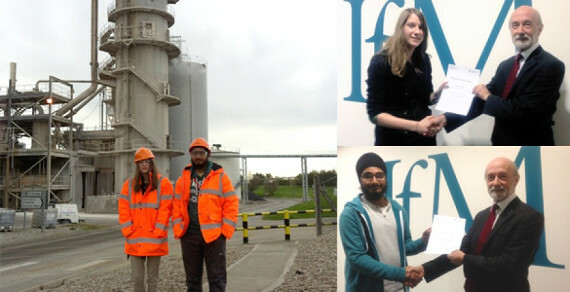 Emma and Harmandeep received certificates of attendance from Professor Sir Mike Gregory. In the evening, the students were able to experience and enjoy college life with the classic dinner at St Catharine’s College formal hall. Dr Nancy Bocken for the value mapping session.